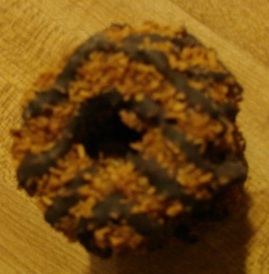 I’m not so sure this is really going to be a review as much as it is an ode to the best Girl Scout cookie ever created: the Samoa. Ok, so as an English geek, I supposed I can’t technically call it an ode as I will not be writing in verse or anything, but the purpose is kind of the same. I intend to “sing” the praises of this wonderful cookie treat. Now, many, many moons ago, I was a Girl Scout. Even then, the best time of year was cookie time. Don’t misunderstand, I liked the camping, the good deed doing and the calendar selling (apparently not all troops did this, but every troop I was in in California did). I even kind of liked the Girl Scout Olympics which was held at a high school track and required us to compete against all the other troops in our county in track and field activities. I ran and did the long jump, but wasn’t good at either, so I never got a ribbon or anything. Back then the world wasn’t quite as touchy feely and we didn’t get ribbons for participating, only for coming in 1st, 2nd or 3rd. I did get a really cool pink troop t-shirt with a unicorn on it though (which I wasn’t allowed to wear, but that is an entirely different story), so that made it sort of worth it. Wow, I really digressed there, huh? Anyway, even as a wee 7-year-old, I loved cookie time. I didn’t really dig the contest for who could sell the most boxes. There was no way I could win that. Even calling all my relatives over 2000 miles away and begging them to buy from me (and they did buy copious amounts) wasn’t going to put me anywhere near the top spot. The other girls had parents who could take their order forms in to work. Not me. My mom was the stay at home variety and my step-dad worked for a company with a strict no soliciting policy. They did not bend for anything, even little girls with chubby faces and Poochie pig tails. No, for me, the joy of cookie time was getting to order my favorite cookies. Every year I would talk my dad (and my aunt and any other family member I could) into buying me a box (or two or three) of cookies. I tried them all. Of course, back in that day there were fewer to choose from. We had Tagalongs, Do-si-do’s, Thin Mints, Chocolate Chunks, Trefoils and Samoas. Between the contributions of my family members and the money I managed to save up (cookies were only $1.50 a box back then), I got boxes of each type of cookie except Thin Mints. I never had to buy those because my mom was addicted and practically bought a year’s supply. After the first year I nixed the Do-si-do’s. They were too much like any other peanut butter sandwich cookie I could get at the store. I only got the Chocolate Chunks one year too. They were good and all, but sort of a souped up Chips Ahoy. They actually had too many chocolate chunks for me and since they weren’t soft and chewy, I wasn’t a huge fan. The Tagalongs were fairly decent, but until my mid-20’s I was never really a peanut butter person (with the exception of Reese’s cups), so I stopped getting those as well. I concentrated my efforts on Trefoils and Samoas. Trefoils were good. Back then they had the giant flecks of sugar on them. I assume they must have been deemed uber unhealthy that way, because I can’t imagine any other reason to take those shimmering spangles of goodness off. I’ve had the newer version and while I still like them just fine, I’m not spending my hard-earned cash on them. Although I do love that my favorite cafe makes a vanilla steamer which tastes just like the cookie of my youth. After awhile, I gave up on the Trefoils too. 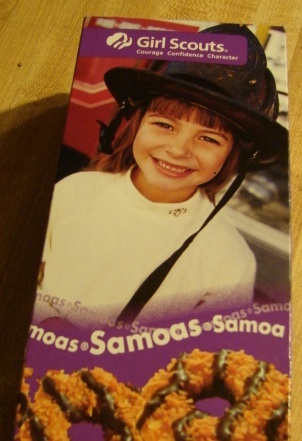 I used all my money (and that of my family) to procure the tastiest cookie morsel to come in a box: Samoas! I don’t know exactly what it is about these delicious little treasures, but I can never get enough of them. The crisp shortbread cookie underneath with the caramel and chocolate remind me a bit of one of my favorite childhood candy bars (Twix). However, there is something magical about the toasted coconut they throw on top that makes it a completely different treat. Considering how amazing they are, I’m still surprised Twix hasn’t come out with a coconut version. I’m not sure it would be as good, but I know I’d try it. Every year I get so excited to get my box. Yes, that’s right, as an adult, I have managed to tame my cookie love just a tad. I limit myself to one box and I savour them. I put them in the fridge so they are cool when I bite in. I love the extra crunch it gives to the cookie. I nibble them slowly since I know I can never get by with only 1 cookie and the box only holds about 18. The coconut melts in my mouth. The chocolate is not over powering, but just a nice companion to the caramel. I love these little gems so much that I have to make sure I have no cash when I enter a grocery store during cookie season. If I do, I must hurry by the tables stacked high with those bright purple boxes, making sure not to look at the sweet faces of little girls peddling them. I am, after all, not a strong woman. I am down to my last four cookies and am already regretting not buying more. I tell myself I should be proud though, my husband devoured his Do-si-do’s ages ago. I know the boxes are starting to disappear from stores, and I am already looking forward to next year. I can’t wait for my little girl to join scouts and start selling. Luckily for her, both my husband and I can sell practically anything we want at school. And teachers are suckers for sweets. While watching the post Valentine episode of Glee the other day, I was surprised by a reference to Mrs. Sees chocolates. It reminded me that while the show may take place in Lima, Ohio, it is quite obviously filmed in California. 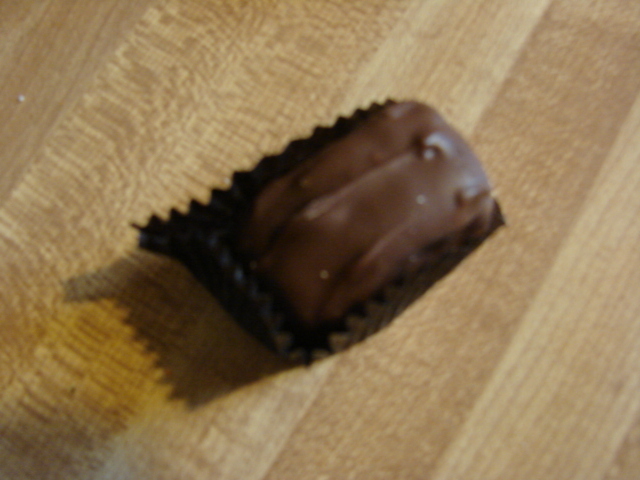 Few people in the Midwest would name Mrs. Sees as the heart shaped box of chocolate they gave to their sweeties. Not that you can’t get her* goodies east of say Colorado, but there aren’t boutiques in all of our malls and finding her anywhere but on her website is, well, difficult. In fact, there isn’t a single store in Ohio. 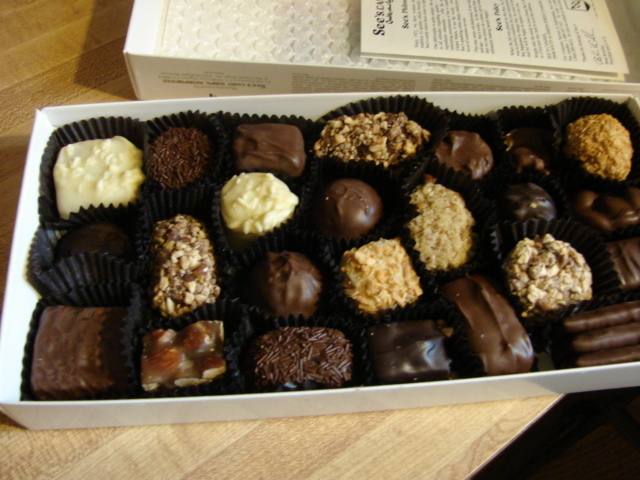 Oddly, despite growing up in Southern California, where it’s hard to walk around the corner and not find one of her shops, it wasn’t until this Christmas that I ever had a box of the chocolates. I guess this isn’t actually so odd considering I was a kid and perfectly happy with a .40 candy bar. Plus, my mom, being a Midwest born had a fondness for Fannie May which was unwavering. I think I had some Mrs. Sees about 8 years ago when I went to visit family in Orange County, but maybe that was just a bite of fudge. Obviously it didn’t make that much of an impression. 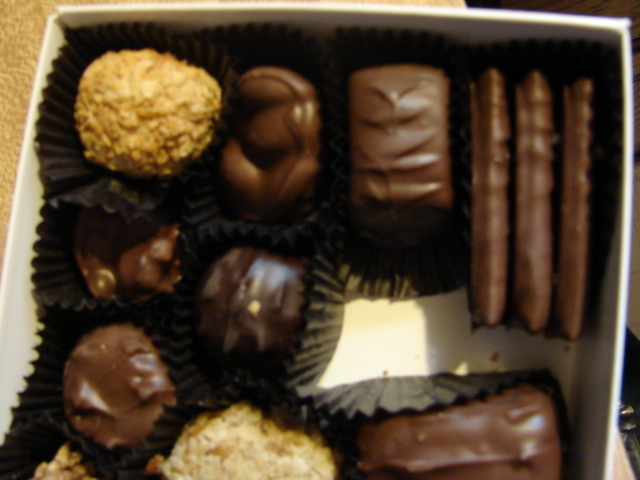 So, when my mother-in-law brought me a box of assorted chocolates from Mrs. Sees, I was rather excited. I’ve heard the hype from West coast friends for years. As is true of most over-hyped items, I’m not sure the actual candies lived up to the mythos. Opening the box, I was excited. There were so many to pick from and there seemed to b e very few repeaters.I reached into the box and grabbed out a roundish one covered in nuts. 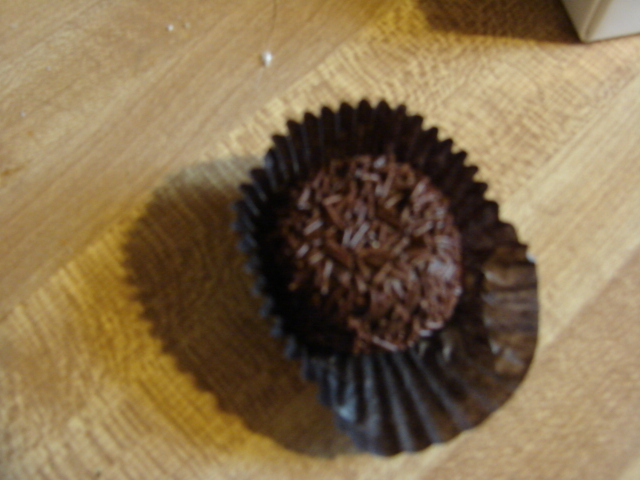 Inside I found a solid chocolate center with even more nuts. It was ok, but the nuts completely overpowered the chocolate. I think I had two moments where I could actually taste the chocolate, which was sad, because it was definitely creamy and I wanted more of it. Since there was no guide, I decided to check the website before trying anymore pieces. I like to have at least a small head’s up as to what I might be putting in my mouth. I’ve had some pretty nasty concoctions before and if I was about to ingest some sort of bacon peanut butter parsnip piece, I wanted to mentally prepare. Luckily, Mrs. See seems to be old school in her chocolate making, and all the combos are pretty safe and pretty traditional. However, the actual pieces in the box weren’t always identical to the website (and several look very, very similar), so I still manged to get a few surprises. And speaking of one of those surprises, it was the molasses chip. For some reason, I must not have paid much attention to the website. After the bite was in my mouth and my eyes shot back to the computers, I found this was one of their signature pieces. That made me a little sad since without the guide, I wouldn’t have known it was molasses flavored at all. I guess my years of snacking on Butterfingers at the movie theater fooled me into thinking I was going to get something similar. And, for a brief moment, it was. It was hard like a Butterfinger, only without the buttery taste. It also got stuck in my teeth just like a Butterfinger. Unlike the Butterfinger though, it didn’t get stuck in my heart. I wound up foisting the rest of these off on my husband. I was kind of 0 for 2 at this moment and feeling more than a little let down by TV and movies. After popping the first nut cluster in my mouth, my outlook didn’t improve. I’m sure it didn’t help that the featured nut was walnut, which I’ve never been fond of. When I perused the site, my heart sank a little as it sees ol’ Mrs. See likes her some walnuts. The chocolate itself was good, but the nuts were just so darn flavorless. I was sinking into chocolate despair. But then, much to my utter happiness, I picked a rum nougat. This one was pretty good. I really liked all the fruit tastes. Even in childhood when other kids were gorging on Hershey bars and Reese’s Cups, I was begging for Chunky bars. I just loved their nutty, raisiny goodness. This rum nougat was like a teeny tiny Chunky, only it had a nice hint of cherry as well. Chocolate and cherry? PERFECT! With my spirits edging back up, I grabbed a milk Bordeaux. It was really sugary. I mean, the kind of sugary that makes my teeth hurt just a tad. But, I can’t say I was entirely put off, because much like Mrs. See herself, it was like a bite of history. It was an old-fashioned cream and it reminded me of being with my grandma. I’m not sure if it was the taste or the rush of nostalgia, but I was starting to warm to the old gal and her black and white box o’ treats. Then, I grabbed what I think might be the Holy Grail of the collection: the apricot delight. From the moment my tongue touched this piece, I was hooked. The chopped apricots were perfectly tart. 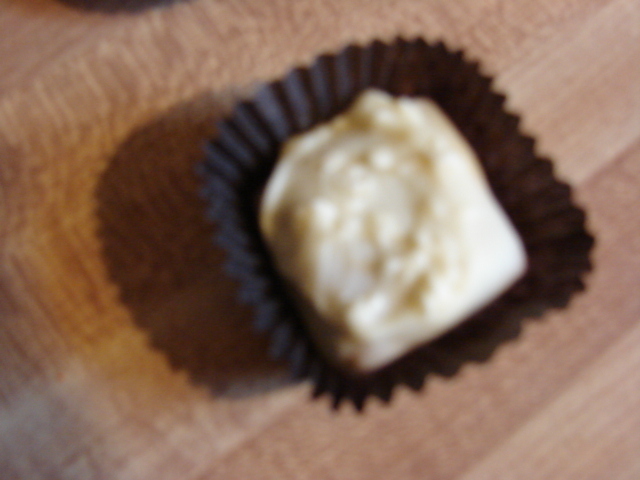 It blended with the buttercream perfectly and had the sweet and dainty crunch of toasted coconut. It was everything a good piece of candy should be. I wanted an entire box of these puppies. With my spirits soaring, I grabbed for a California brittle (hard toffee with almonds). At first I was a bit taken back by the saltiness of it. I eat a lot of toffee (my husband makes it from scratch and it is AMAZING) and I generally like my toffee sweeter than her offering. I was thrown by a slightly odd taste I couldn’t quite put my finger on, but it settled well and by the end of the bite, I ended up liking it. 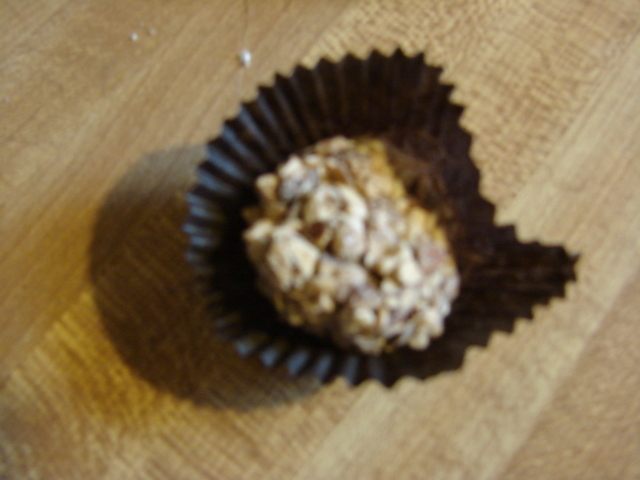 I went on to try another nut cluster, this time covered in dark chocolate and to my surprise, I liked it. It was not a bitter dark, which was nice. I also liked the peanut nougat just fine. It was a bit like a harder version of a Snickers, and really, who doesn’t like a Snickers? Crazy people, that’s who. The divinity piece was extremely creamy. The coconut flecks really helped the texture and amazingly, the walnuts added just a hint of crunch with no icky walnuty after taste, which was nice. While not my favorite (there is no beating that apricot gem), it was quite good. My last piece was a milk buttercream. The second I bit into it, I was hit with a wave of nostalgia. With one tiny bite, I had this flash of buying these gigantic chocolate Easter eggs during a trip to the grocery store. I must have been about 10 and some group had a fundraising table set up just outside the doors (it was California after all, no need to be inside to sell). My mom bought two, one for her and one for me. We couldn’t eat them in one sitting. Heck, we couldn’t even eat them in a couple of sittings. She had to slice them up and give them up and dole them out a little at a time. I’m not sure if the eggs were that big or that rich, or that expensive, but we savored each and every bite. Every Easter afterwards I hoped to find a similar table, but we never did. We had them one year and that was it. I spent a good portion of my adult life looking for those eggs, only to be disappointed at every turn. This little round delight was very creamy and fudgy, just like the memory egg was. It was simple, sweet and just so darn good. Before I even finished the piece, I was emailing my mom to find out if the eggs of my childhood had been bestowed upon us by this wonderful woman. She can’t quite remember. She thought they were from another company, but also didn’t remember getting them at some stand outside the grocery store. I’m not sure which of our memories is more accurate. What I do know is that I will be visiting Mrs. Sees sight around Easter time (I checked and they make this piece in egg form) to order one for the holiday. While the first few pieces prepared me for a scathing review which I knew would be hated by Mrs. Sees fans everywhere, the second half of the box restored my faith quite a bit. I still think they are a bit over-hyped, but they are pretty darn good. Unlike some of my other favorite companies, they aren’t trying to re-invent chocolate. They don’t want it to come kicking and screaming into the 21st century. Mrs. Sees is cool with old-fashioned and simple. That’s obvious from the packaging to the offerings. It’s also true of the fairly classic tastes. *I do realize there is no old granny slaving away over copper kettles making these chocolates, but the chocolates did give me a sort of down home feeling, so I decided to stick to referring to an actual Mrs. See. Sorry to those of you who were hoping to read about my latest chocolate treasure, but this post is about something far more important. I know, I know, that seems a bit foreign coming from my keyboard, but as much as I adore chocolate, I’ve got something a bit more serious on my mind. I’m a teacher, and a darn good one to boot. For the past 13 years, I have worked very hard to help my students become better. Better writers, better readers, better communicators, heck, better people. I cannot count the number of hours I have spent over the course of my career revamping lesson plans to appeal to a new group of students or writing detailed suggestions on drafts of research papers so my kids can improve them. I do not know how many hours I have spent worrying about kids who I know are using drugs, going through horrible break-ups, losing parents or having trouble fitting in. I’ve lost track of the free time I’ve spent outside my work day getting to know my kids and lending an ear when they feel the world is crumbling down around them. In short, I care. A lot. Sometimes far, far too much. In the last few years though, the profession I have cherished has really changed. Teachers are being vilified, no longer by angry students or even parents, but by the news media. We are being blasted for being over paid and not giving enough of ourselves. We are being blamed for just about every societal ill out there and frankly, I’m sick of it. I’m also sick to my stomach over the House and Senate bills currently being pushed through the Indiana government. The governor, for I refuse to call him my governor, and the superintendent of public schools have supposedly made it their mission to reform education. The only problem is that little of what is being purposed is actual reform. Much is supported by shoddy research (or in some cases none at all), misinformation and the need for drastic budget cuts. Very little of it has any true educational benefit behind it. Much of it seems to be a vindictive attack on teachers. Now, I don’t doubt I’m taking this a bit personally. The only political issues I ever get really, really fired up about revolve around education. Like I said, I’m one of those teachers who really, really cares. What I can’t understand, is if the governor and Mr. Bennet want true education reform, why they aren’t actually advocating changes at the most basic levels: colleges producing teachers. If real education reform is desired, why not change the way teachers are educated? I find it absolutely reprehensible that most colleges require a mere C average to graduate with a teaching degree. We expect excellence from our juvenile students, yet allow their teachers to be mediocre. This doesn’t make sense. Teachers should be people who appreciate the educational process. They should enjoy the classroom environment. They should have a real enthusiasm for learning, not a wish to just get by. How can they demand their students rise to expectations they were not willing to rise to? If real educational reform is what our legislators are after, why not change the way teachers are educated? Accepting mediocrity and expecting high performance is asinine. In addition, Indiana allows potential teachers to take the Praxis tests (standardized tests all teachers must pass, which cover a variety of areas, including general education knowledge, and content specific information) until they pass it. We don’t even allow this of our high school students. Those students are given five chances to pass the ISTEP. If they do not, unless they complete a very lengthy waver process (which so far my school has had 1 student do in the 5 years I’ve been there), they cannot graduate from high school. And yet, that same child’s teacher is allowed to take the Praxis test an unlimited number of times. How in the world does this make any sense? If teachers cannot pass this test with the minimum scores required after three or four times, why should they be allowed to teach? Doctors, lawyers and many other professionals with standardized tests have limits to the number of chances they get to pass. So should teachers. And while on the subject of teacher training, I find it amazing that college students can spend as few as 10 weeks in a classroom setting during their student teaching and still be allowed to become licensed teachers. This is far too little classroom exposure to truly prepare anyone for their own classroom. Not to mention that with the transition to teaching program, the education foundation and student teaching requirements are almost nil. People who happen to have a bachelor’s degree and have worked in the business sector can become fully licensed teachers in as little as 18 months. How in the world is this proper training? Again, if any of the current rhetoric was about real education reforms, some of these issues would be under the microscope. So would coaching and club sponsorship. As rewarding as I find the extra-curriculars I have had the benefit of sponsoring during my teaching career, it floors me that schools allow first year teachers to take on these assignments. If real education reform was the goal, wouldn’t it be better to allow new teachers a chance to develop as teacher before they add something as stressful as coaching into their lives? Far too many people who enter classrooms are coaches first and teachers second. Maybe if they had a chance to really hone their teaching skills for a year or two, they would become teachers who happen to coach. I could go on and on for hours, but as I have to be up at 5:15 to make it to work, I need to turn in. I’m sure I will re-visit this topic because it is something I feel truly passionate about. My dander is up because so little of the bills introduced are about reform. They are about finding a scapegoat. In this economy, it seems the public is out for blood and our governor is happy to throw us to the wolves. One of the biggest problems I’ve encountered being an educator is that education seems to be the only profession that everyone feels they have a right to voice their opinion about. It seems that because every single person in this country has had to sit in a classroom for at least 11 years of their lives, they somehow feel entitled to give their solutions on how education should be managed. I would never presume to tell my doctor, my lawyer, my accountant or even my mechanic how to do their jobs. Few people would. And yet everyone feels it is their right to tell me how to do mine.